Welcome to our website that aims to give you unbiased reviews of graphics tablets and related products. Check out the reviews and guides below or use the search box to navigate the site. If you are thinking of buying your first Graphics Tablet, read our Getting Started Guide, where you can find the answers to the most common questions you might have. Top graphics tablets to consider. We regularly create a page where we list the current top selling graphics tablets to make it easier for you to choose the best model for your needs. However, if we take an overview of the features and capabilities of the graphics tablets, versus the price and manufacturer, these are the top selling products. There are many different reasons why you might want a Graphics Tablet. Most likely, you are already using your computer to do some sort of creative activity, such as digital photography, artwork using Adobe Photoshop or GIMP or even digital scrapbooking. 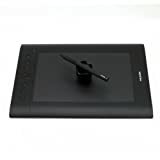 It is also a fair assumption that you will be looking for a graphics tablet to replace what you currently use your mouse to do – and yes, I know, drawing in Photoshop is almost impossible with a mouse. Not totally impossible, but certainly not the easiest way to draw on a computer. A graphics tablet will allow you to translate more easily between what your hand and fingers want to create and what you want to appear on the screen. Using a stylus, drawing on the graphics tablet will move the cursor the screen, matching every move you make, which makes it far easier to draw on-screen. There will be a learning curve to using a tablet, after all, you will be looking at the screen and drawing on a separate surface, which can be confusing at first. You can buy graphics tablets that are essentially an LCD screen that you draw on, making a true 1-to-1 experience. However, these types of products are more expensive and are usually used by professional artists, animators or designers. They are not something you might find in everyone’s home. When looking to buy a graphics tablet, there are a few points that you will need to consider. Most of the products look the same, but there are subtle differences that will make your experience better and more fulfilling as a creative person. If you are already an artist of some sort, creating paintings, photographs, images or drawings, you don’t want to be constrained by the size of your “digital paper”. Every single graphics tablet offers you a direct 1-to-1 transposition between the device and the screen. When you move the stylus on the tablet to the top left hand corner, the cursor on your computer screen will move to the top left hand corner. When you do the same, moving the stylus to the bottom right, the cursor on the screen will follow, going to the same place. If the tablet is small in size, your pen strokes can end up being very large on the screen. The larger the tablet and the greater the “active area” the better detail you will be able to see on the screen. Some small tablets can be ideal for people who only want to digitally sign documents, or do some basic touching up on digital photographs, but drawing is easier with a larger tablet. Combined with the size of the tablet and active area, is the number of Lines Per Inch (LPI) or the resolution of the device. Just like a computer screen, graphics tablets have different amounts of receptors where the stylus is registered when moving on the tablet. The greater the number of LPI, the more sensitive it will be, making your drawings more detailed. The majority of graphics tablets have different levels of pressure sensitivity, where the harder you press down the stylus on the surface, the thicker or darker the line will be on the screen. The standard level is 1024, with more expensive and professional tablets using 2048. The higher the number, the more detailed and lifelike the strokes will be.